In a near-future New York subject to an increasingly frightening and repressive government, Laek, a non-conformist history teacher, and Janie, an activist lawyer, struggle to keep themselves and their loved ones safe while standing up for what they believe. After Laek is badly injured in a brutal confrontation with the police, they are forced to flee across the border by bicycle with their two young children. In a Montréal that the future has also transformed, the family faces new challenges: convincing the authorities to grant them refugee status and integrating into Québec society. Will they find safety in their new home or will threats from across the border continue to put them at risk? Told from the points of view of the four family members, Cycling to Asylum is a unique work of interstitial fiction from an exciting new Montreal author. Cycling to Asylum was longlisted for the Sunburst Award for Excellence in Canadian Literature of the Fantastic, and has been optioned for a feature length film. Individuals can purchase my book directly from the publisher here. Cycling to Asylum can also be ordered from IngramSpark. In Montréal, Cycling to Asylum can be purchased at Argo Bookshop, Coop La Maison Verte, Maison des cyclistes, Librarie l’insoumise, and Concordia Community Solidarity Co-op Bookstore. In Toronto, it is available at Bakka Phoenix Books and Glad Day Bookshop. 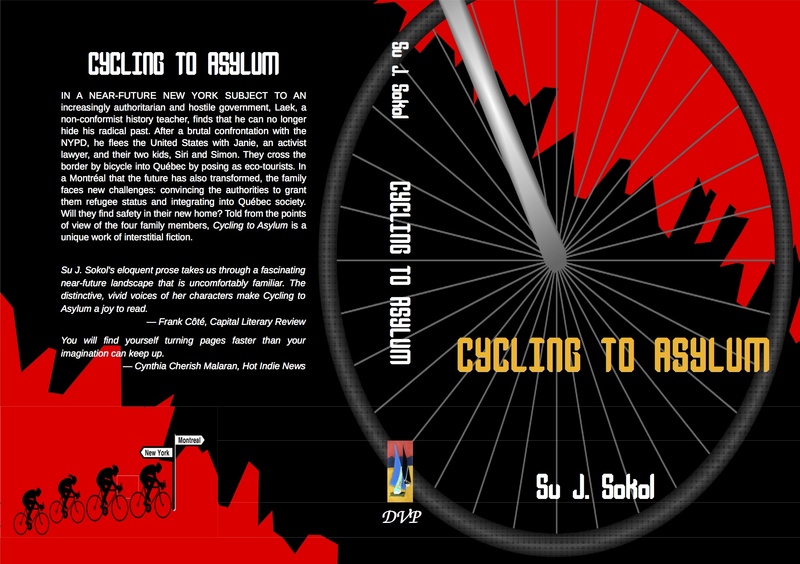 Cycling to Asylum is also available as an ebook at a number of different digital stores. Please also check with your local bookstores and libraries! Cycling to Asylum is the story of a family that flees a near-future New York City and crosses the border into Québec by bicycle to demand political asylum. As such, the novel is the story of a voyage, both an actual and personal/metaphorical one. This voyage is experienced differently by each family member and it is for this reason that it is told in alternating chapters, using the unique voice and perspective of each of the four main characters. These characters include Laek, a history teacher with a mysterious, radical past; Janie, an activist lawyer and musician; Siri, a tomboy with secrets; and Simon, a dreamy child addicted to violent screen games. An important aspect of this voyage is that it is a bicycle voyage. The pacing of the story reflects this — at times fast, frenetic and dangerous, like a bike messenger zipping through Manhattan during rush hour; at other times slower and more contemplative, making it possible to notice not only the big landmarks along the way but the road’s pitted surface and the unusually beautiful flowers growing just beside it. Traveling by bicycle makes you aware of your vulnerability as you seek out the sudden gaps and paths that open up between the traffic. You can feel the air on your skin, smell car exhausts and bitter asphalt as well as lilacs and baking bread. You can get out of tight spots, but you have to rely on your strength as well as your reflexes. Biking is a very immediate, intimate experience and this is the kind of story that this is. It is why the story not only has four different points of view but is told in the present tense. Cycling to Asylum is a work of interstitial fiction, embodying one of the story’s important themes: reaching across boundaries to find a way for hope to triumph over despair. C2A was published in June 2014 by Deux Voiliers Publishing. Author And Social Rights Advocate Su J. Sokol’s Top Fifteen Favorite Songs Of All Time, by Alex Green, editor and chief of Stereo Embers Magazine, lists fifteen of my favourite songs, including some videos, while talking about my novel, Cycling to Asylum. Djibril al-Ayad interviews Su J. Sokol on Fabio Fernandes’ blog, Different Frontiers, about Cycling to Asylum, and the intersection of literature, the personal and the political. Author Interview with Montreal “Interstitial” Writer, Su J. Sokol by writer and blogger Dyane Forde where I talk about writing, interstitial fiction, and Cycling to Asylum. Radio interview on CKUT radio about Cycling to Asylum, art, and politics. The New York book launch was held on Tuesday evening, June 24th, 2014 at the Community Bookstore in Brooklyn. I’m counting American flags. Eleven regular-sized, five minis, three hanging sideways, fascist-style. A giant one suspended from a thick metal pole in front of the bank. And the two hanging from either side of the police car just ahead. I stop counting. Quickly switch lanes. Keep pedaling, Laek. Just keep pedaling. I continue north on Fourth Avenue. There’s no need to check my screen or project a holo map. I know where I am. I know what time it is. My body can feel these things. So I sense that I’m not going exactly north, but more northeast. The convention is to say north, though, because of how the grid runs in this corner of Brooklyn. My bike is moving fast. Slicing through the heat. Sweat streams down my shirtless back and under my arms. I don’t mind the sweat, the heat, and besides, it’s only 91 degrees. Not too bad for 6:58 a.m. on a late March morning. A heavy truck rattles by. I feel a whoosh of hot air as it whizzes past me, inches from my left elbow. I hold my ground. A car comes up on me from behind. Sounds its horn. Does it think I don’t know it’s there? That I can’t feel its heat on my bare neck? My eyes dart between the traffic on my left and the double- parked cars on my right, alert for opening doors. I’ve only been doored once, the slight asymmetry of my handlebars a constant reminder. The sour stench of garbage combines with the delicious aroma of fresh muffins. Owners of local diners and bodegas are neutralizing alarms, unlocking gates and resetting their holo-boards. Homeless people still asleep are pushed away. Some with kicks and shouts. Some with phaser rods. A rod is raised. I slow, body taut, ready to intervene. It’s lowered. I move on. I fill my lungs with the early morning air. Reach my arms above my head. The wheels of my bicycle vibrate on the warm pavement and, like a tuning fork, I respond with a sure, steady hum deep inside me. I stretch my gaze west, towards the piece of sky that’s visible beyond the urban landscape. There’s a greenish-brown stain around the edges, but it’s still beautiful, still fills my heart with the hope I always feel looking at the morning sky. Like the City’s beginning again. Like something good could happen. At Ninth Street, I turn left towards the Gowanus. Once in Red Hook, cut off by the expressway, the walls of the neighborhood close in around me. I coast to a stop in front of my school. Dismount. We’ve started a new unit in ninth grade history: Citizenship, Patriotism, and the Social Contract. Should I mention the new anti-immigrant laws? Should I mention flags? I slip on my shirt. Bound up the broad concrete stairs with my bike. Inside, I notice a new security guard. I hesitate. Then give her my best smile. She doesn’t ask for my wrist to scan my Uni. Relieved, I dig my hands deep into my pockets. Disappear into the distortion field of the elliptical security booth. I hold my breath as currents of metallic, tangerine air surround me. Once I’m through security, I exhale slowly. Walk down the hallway towards the teachers’ lounge. I roll my bike beside me, the sweat drying under my shirt. In the classroom, I get to work activating new holographic images. A security gate appears across the door. Stern-faced officers blink into existence. I add teeth-baring dogs. They snap at the air, barely restrained by their uniformed handlers. Nearby, I place other holos. Unified National Identity data being imbedded in wrist chips. Oaths being sworn. People marching. At the back corners of the room, adults and children of various races and nationalities, their possessions on their backs, wait patiently. The line of refugees disappears into the horizon. At the last minute, I add American flags of all types and sizes, waving disjointedly. My ninth graders begin to file in. Some seem excited, their heads whipping around. Others are looking down and clutching their school screens tightly. I begin class, hoping I haven’t overdone it. Even after turning the lesson into a game, with the apples I’ve brought for prizes, a few of my students still sit in their seats, fidgety and tight-lipped. “I am,” Sasha answers timidly. “But he hasn’t even answered one question!” Marcus complains. Before Marcus has a chance to retaliate, I put my hand on his shoulder and squeeze. Hands dart into the air and I watch the fight resolve into an intellectual debate. I toss an apple to each student who hasn’t received one yet, starting with Sasha. “You have enough for everyone?” Marcus asks, surprised. At lunchtime, I head over to the teachers’ lounge. “There’s coffee,” Erin says, pushing dark bangs from her eyes as she studies her screen. She takes a gulp of coffee. Grimaces. Returns to studying her screen. “Is that sour look from the coffee or what you’re reading?” I ask. “I’m teaching the required curriculum,” I tell her. “Where are you getting this?” I ask her. “But you know the answer to that, Laek. You’re an adult now.” She says this like my transformation into adulthood happened just yesterday. As though I wasn’t a man of thirty-two, only one year younger than her. “But in the meantime, we need to teach about the world as it really is,” Erin says. I met you at the Readercon in the Boston area this summer and bought a copy of Cycling to Asylum, which I greatly enjoyed. After this week’s Presidential election, it seems oddly prophetic. Thanks, Mike. Yes, you are not the first to say this. (People are saying the same thing in reference to the late Octavia Butler, and it is very cool to share … well, to share anything with that great writer.) Thanks for getting in touch and I’m glad that you enjoyed the book.